UNWRI TT EN | Battling the blank page one inspiration at a time. 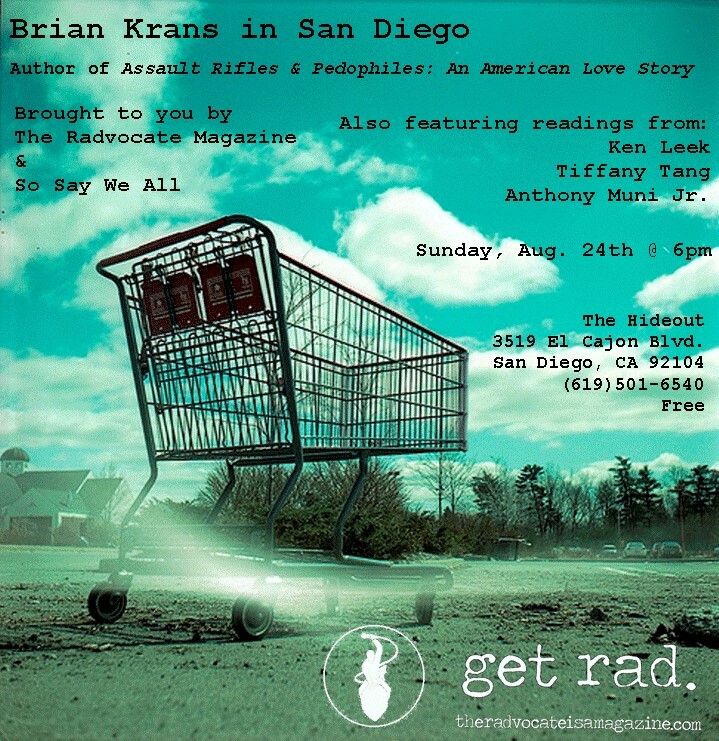 In San Diego this weekend? 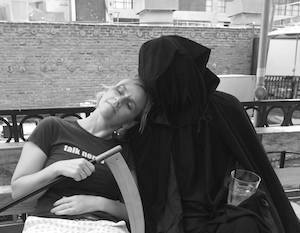 Join me and Death and a plethora of local and amazing authors for a brief read and chat over cups of joe. See you there! It’s July in San Diego, which means Comic-Con descends upon downtown and the air is filled with the sound of Nerdist live podcasting. It’s truly a beautiful time for us geek chic wannabes. I love that, these days, the ones who were once uninvited to the table of cool kids are instead having kickass lunches on hovercrafts and space station bridges, enthusiastically inviting all around them to attend. I heart the nerds. 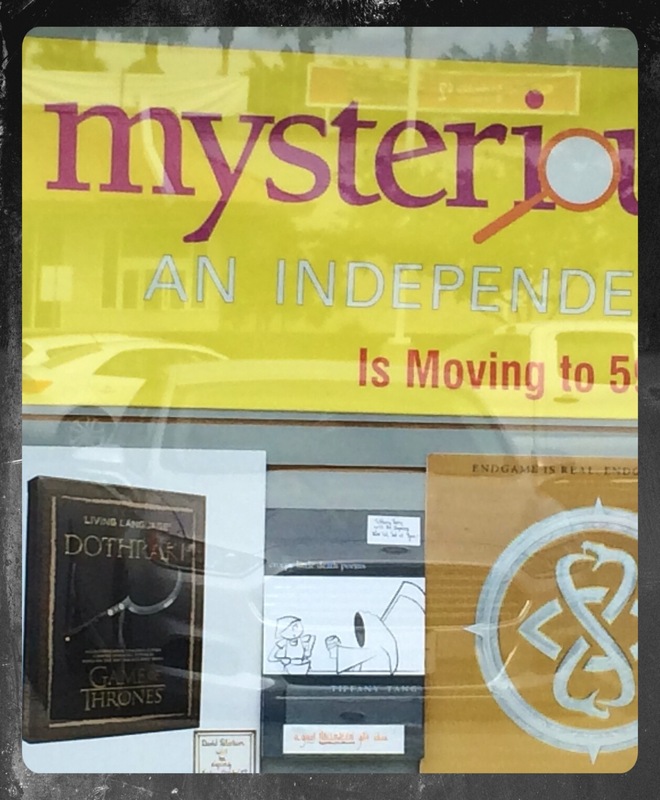 A few months ago, I had the privilege of being interviewed by one Barbra Dillon of Fanboy Comics, a Comic-Con uber-presence, which to me meant that creepy little death poems had officially achieved a brand new amazing level of cool. 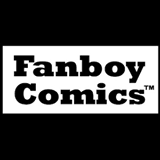 Be sure to check out Fanboy at Comic-Con if you are in town for the week and enjoy all of the yub nub! 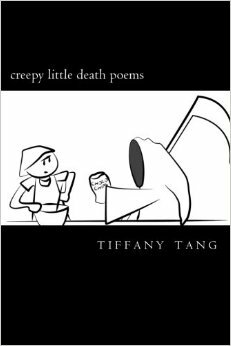 Barbra J. Dillon, Fanboy Comics Managing Editor: Just over a year ago, you released your first poetry collection, Creepy Little Death Poems. What inspired you to take on this subject matter, and do you feel that the creative process of writing the collection impacted you as the project took shape? TT: Joan Didion said, “I write entirely to find out what I’m thinking, what I’m looking at, what I see and what it means.” For me, writing the poems was a transformative experience, one that helped me unpack and cope with a really dark time. Depression can be mysterious. It’s intangible and tangible at the same time, because, for me at least, I would feel it emotionally as well as physically. I think that’s why the image of the Grim Reaper, or, to be more accurate, the Ghost of Christmas Yet To Come from A Muppet Christmas Carol (because I’m a total holiday nerd), made so much sense to me…READ MORE AT FANBOY. 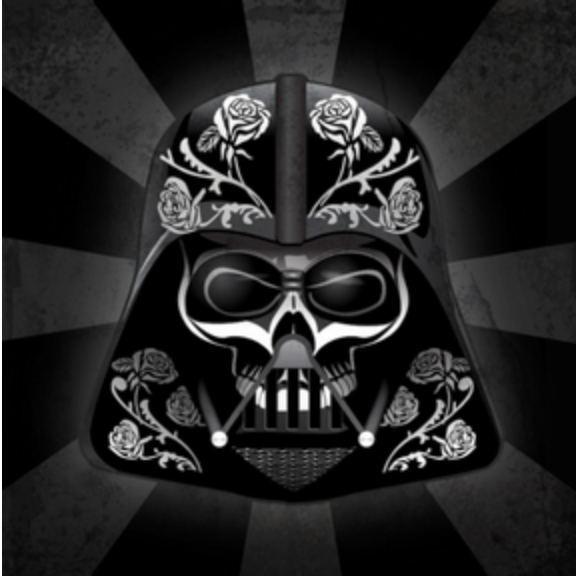 Day of the Dead at Mysterious Galaxy! See below for a sneak peak at the reading! 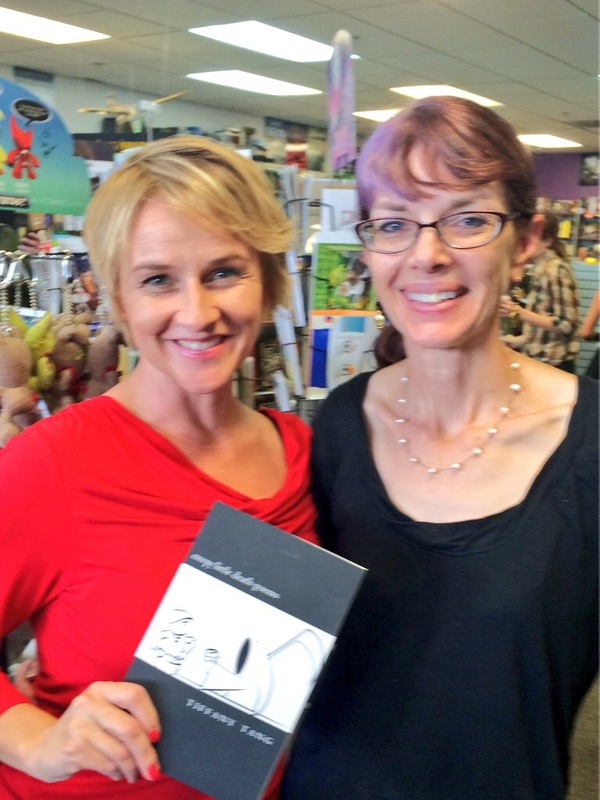 KPBS horror geek Beth Accomando snagging a copy of death poems’ for her mom’s birthday. Yes, I just said that. 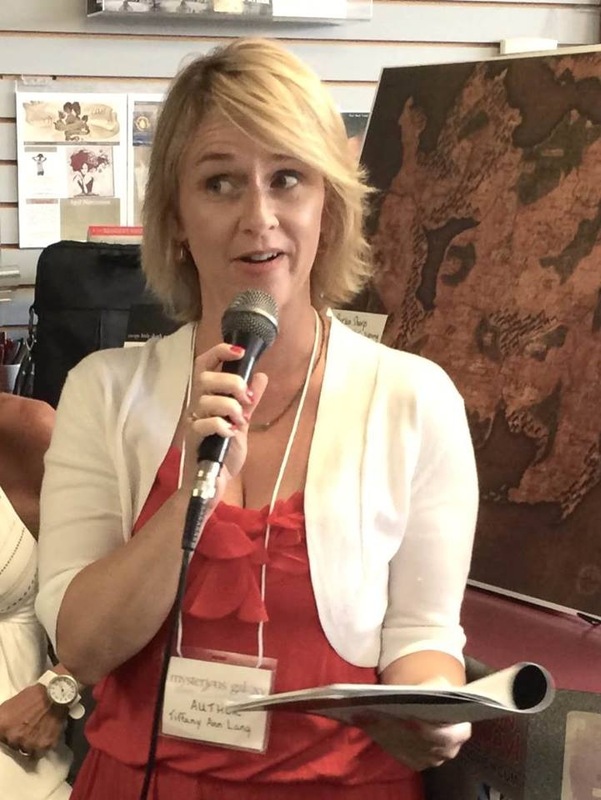 Tiffany Joins a Panel of San Diego Indie Writers! 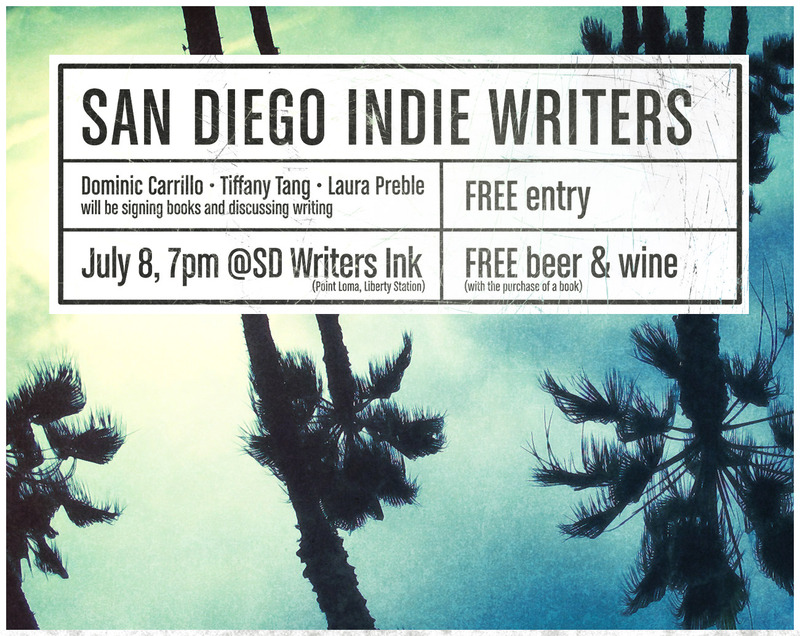 San Diego Writers, Ink has graciously invited us to host an event on indie publishing on Tuesday, July 8 at 7 pm. Join us for an evening of book signings, readings and publishing discussions. Laura Preble, author of OUT, 2014 SD Book Award Finalist for Young Adult Fiction. Featured in the U-T San Diego! 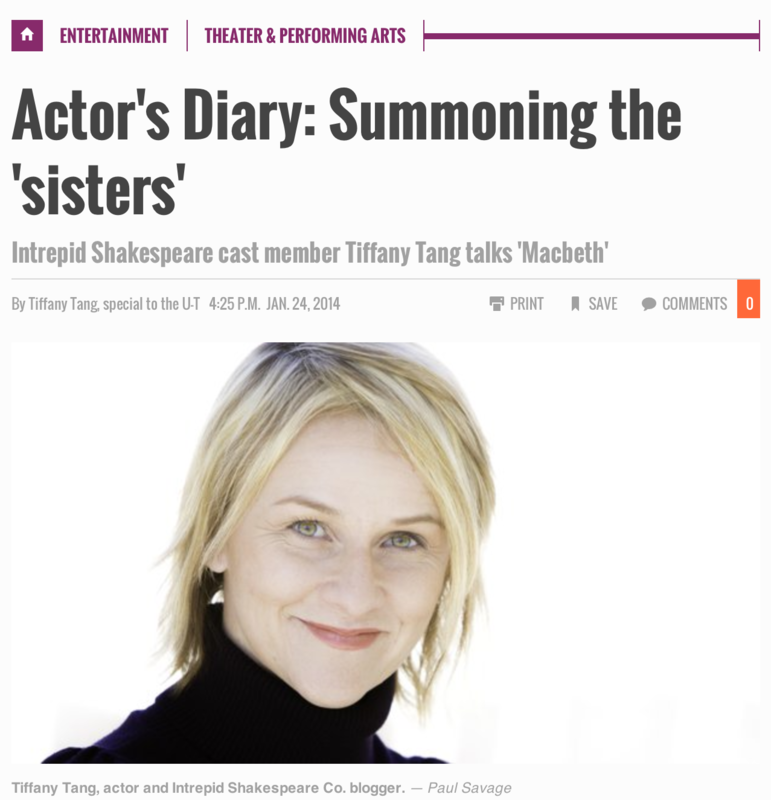 San Diego’s newspaper, the Union-Tribune (U-T), recently invited me to do a four-part series for the Sunday Arts section chronicling a behind-the-scenes perspective of my role as a Witch in Intrepid Shakespeare Company’s Macbeth. Thanks to Arts & Entertainment Editor Michael Rocha for giving me the space to say things like “prosthetic glue boogers” and “pig intestines” in print. That is what I call ‘trusting a writer’ and I am very grateful. James Hebert, theatre critic for the U-T, says, “If you haven’t had a chance to check out our ongoing ‘Actor’s Diary’ by Tiffany Tang, who’s now appearing as one of the witches in Intrepid Shakespeare Co.’s Macbeth, you’re missing out on some excellent writing and vivid behind-the-scenes insights.” Aw, shucks, Jim. Links to the four installments of the ‘Actor’s Diary’ are below. Also, check out the U-T‘s accompanying video package on Macbeth. 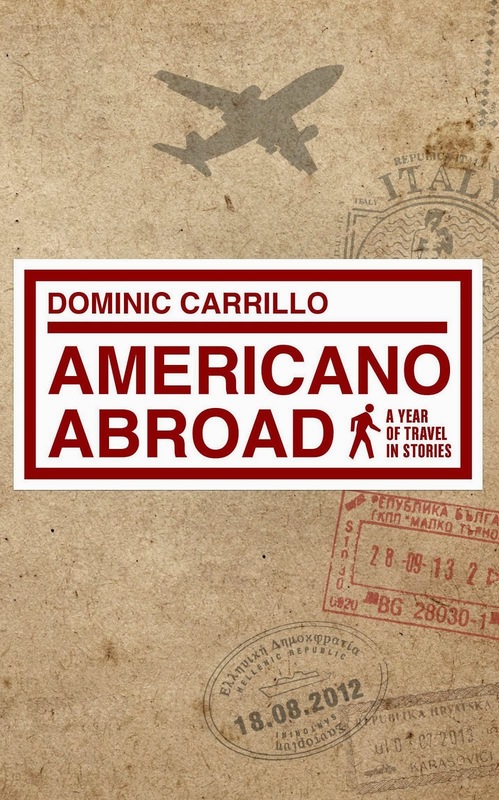 Dominic Carrillo has created a new holiday tradition: Fly home to San Diego, spend time with family and friends, host a book signing for a recent publication at a local trendy hot spot, and return to his adventurous life abroad. Since the debut of his first book last year, To Be Frank Diego, a novel which follows the struggle of a racially mixed main character as he navigates growing up just north of the Mexican border, Dominic has been eager to compile his more autobiographical pieces into a second offering. This year, Americano Abroad is the result: a compilation of essays lifted from his popular travel blog of the same name. The San Diego book signing will be held at the evening before Dominic returns to teaching in Sofia, Bulgaria. Deciding what to include in the collection was no easy feat. 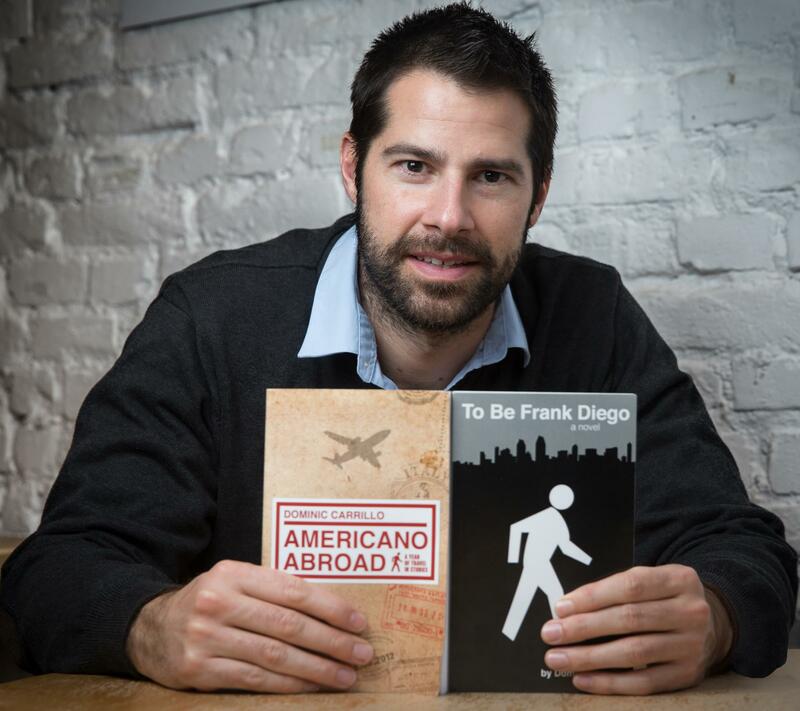 Publication of some of his pieces in the San Diego Reader helped make the decisions as well as an expat writing group in Sofia. Separated into three sections, the book begins with an exploration of Italy, Dominic’s first experience living abroad, The writing then moves through Nigeria, his first official teaching stint, and into Bulgaria, where he now resides. 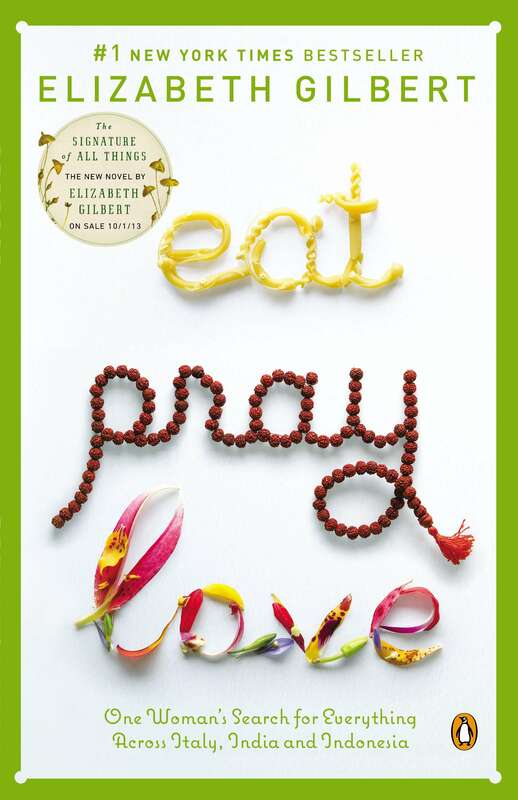 Although he describes the book as “memoir,” Dominic is quick to point out that it is no Eat, Pray, Love. In addition to reflections on his local surroundings, the book is also interspersed with homecomings and analysis of American culture. In fact, as much as the essays seem to be an exploration of Dominic’s travels, his writing spends an equal amount of time unpacking what it is to be an “American,” as the title of his book suggests. “In Italy, I tried to turn my complaints into humor and joke about it,” Dominic says. “In Nigeria, the switch was that I realized I didn’t have the right to complain about anything. There’s such poverty and every reason for people there to be hopeless and pissed. And people were awesome. They were genuine and happy and welcoming.” The awe in his voice is unmistakable, even though it’s been many months since his stint with the boarding school there. From there, everything changes. The writing from Bulgaria is infused with appreciation, as if the practice of moment-to-moment living Dominic gleaned in Nigeria has never really left him. Even Dominic has noticed the difference in his own “Americano” analysis of his foreign surroundings. “It’s a different kind of reality check,” he says, commenting on how his teaching colleagues stationed in other countries would ask about Bulgaria with a smirk, as if this situation was somehow less glamorous. “Everything after [Nigeria]… I just felt thankful and grateful for everything I have.” Dominic has just re-upped for a second year of his English teaching position in Sofia. Those feelings of gratitude also extend to his local fan base. Sharing his new book with family and friends in San Diego is becoming part of the publication process, and he continually finds the support overwhelming. The reactions of these readers who have followed his blog since its inception have had a huge impact on his voice, Dominic says. “In the beginning, it was trial and error,” he says, explaining that his first pass at travel blog writing resulted in guided tour analyses, containing very little personal commentary and very little humor. 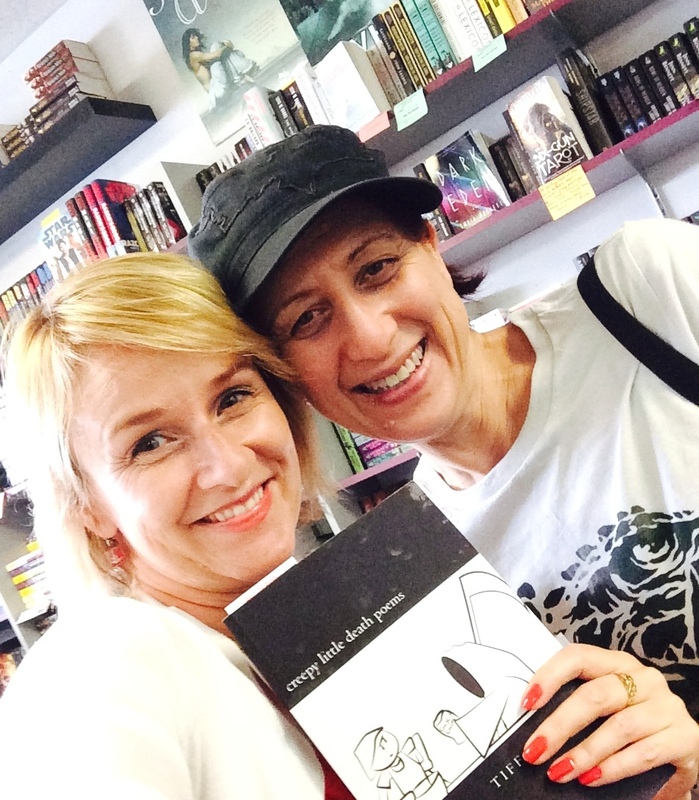 Three blog entries later, with a little exposure to David Sedaris and some positive feedback on the more sarcastic portions of his pieces, Dominic wrote what would become the first chapter of the book – a humorous commentary on teaching English in Italy and feeling like a fraud. This entry caught the attention of his eighth grade English teacher in San Diego. Say what you want about behemoth bookshops. Barnes & Noble has been quite good to me over the years, if only for the fact that they have provided me with opportunities to exchange a laugh or two with people who completely inspire me. 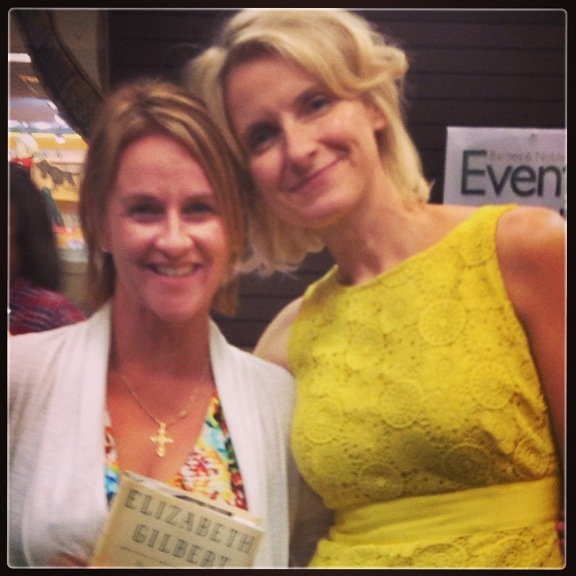 Last Monday, Barnes & Noble sent me Elizabeth Gilbert. Yes, I’m a big Eat, Pray, Love fan. Who isn’t? Who didn’t read that book and all of a sudden treat themselves to luxurious artist dates consisting of solitary brunches and meditative labyrinth walks? Who didn’t follow her journey and repetitively conjure up friend after friend who would appreciate this section or that? “Oh, Suzanna would love this part about Italy,” I would think to myself while reading, and “I wonder what Stacia would think about this part in the ashram?” or “I can absolutely see Lisa and Tatiana and I having this conversation over dinner at French Roast.” And on it went. Book clubs happened. Copies were wrapped in Christmas paper and sent to the post. It was, and still is, at the top of my reading recommendation list. 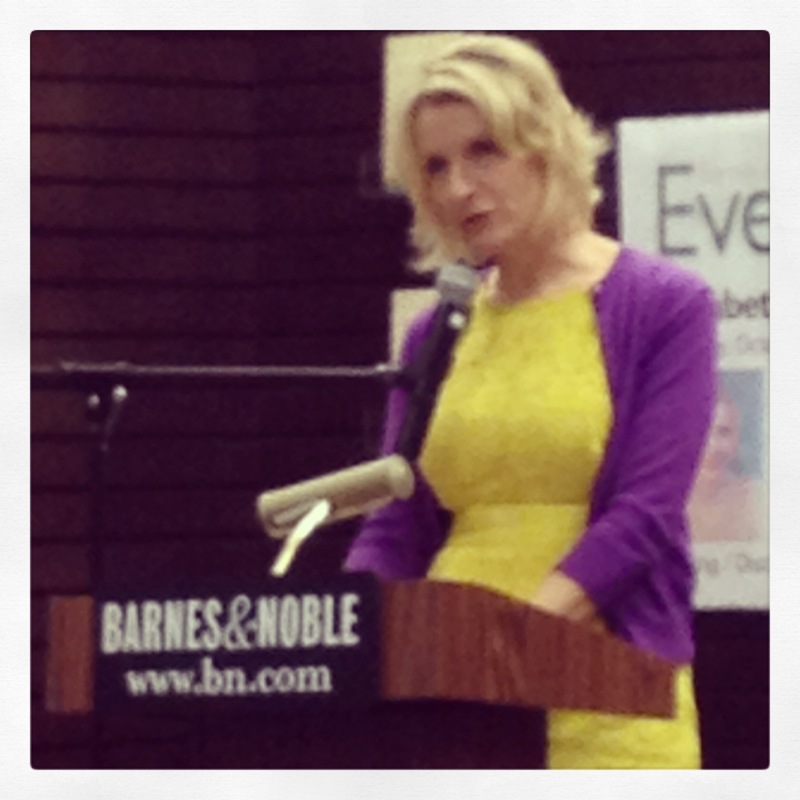 “Writing is the thread that has sewn my life together,” said Elizabeth Gilbert at the Barnes & Noble event space adjacent to the loudly colorful children’s section. At least, I think that’s what she said. In a moment of haste, regretting the absence of a notebook in my purse, I busted out a pencil and started scratching in the back of my copy of her latest offering, The Signature of All Things. Anyone who knows me has witnessed those moments when I am caught scrutinizing my own writing as if it were a secret message from Orphan Annie and I am sans a decoder ring. (Yes, my life revolves around Christmas references. Get over it.) So, bear with me. I think anyone who calls herself a writer would recognize that notion of not being able to truly understand things until they’ve been… I was going to say “written down,” but actually I think “written through” is the more accurate preposition. To “write something down” has such finality. To “write through something” implies work, journey, understanding. Joan Didion said it so many times in her personal essays: “I write entirely to find out what I’m thinking, what I’m looking at, what I see and what it means.” Even now, I have a dear friend who is Frankensteining her way through unpacking her childhood abuse, writing through her experiences, bringing light to the dark corners. I don’t know if Liz Gilbert feels exactly this way, but she contended that she even after the great success of EPL, she knew she couldn’t leave writing behind, get a big house, and “raise Corgis.” And so it is. Writing as necessity. In her own “Thoughts on Writing,” she says, “I never promised the universe that I would write brilliantly; I only promised the universe that I would write.” Joan said, “We tell stories in order to live.” Indeed. Of course, this blog is about the not writing, the question of what happens when that is true and yet the words/space/time/healthy psychological headspace don’t seem to come. Liz had some things to say about this, too. Since she was raised on a farm, she says, her writing process is seasonal: the season for inspiration, the season for research, the season for writing, editing, and finally, for rest. Sometimes these seasons can take days, and sometimes they can take months. Sometimes, like winter in Westeros, they can take years. Three years of research. Three years of preparation. Three years of curiosity. After that, writing was like painting a room where the the furniture had already been moved and the windows pre-taped. “I feel sorry for the girl I was in my 20s,” she laughed, who would often try to paint only to realize there was a couch in the way. She spoke of sitting and staring at the blank page wondering where the inspiration was going to come from. She would later discover the way of the creative warrior. Of course, we’ve all seen her eloquent TED talk, where she outlines the potential parameters of genius, inspiration, and creativity. But the counterweight to creativity? Compassion. In a discussion about women and artistic pursuits, Liz pointed out that we are very likely a “new species.” We have no role models, no history, no mythology to reference as we go about our lives making decisions about family and career and balance. Never before have we had such freedom of self-determination. Here, she referenced Martha Beck, fans of her Facebook page, and also her sister as examples of the one thing that will enable us to truly embrace who we are and shine appropriately – compassion, for each other, but most importantly for ourselves. 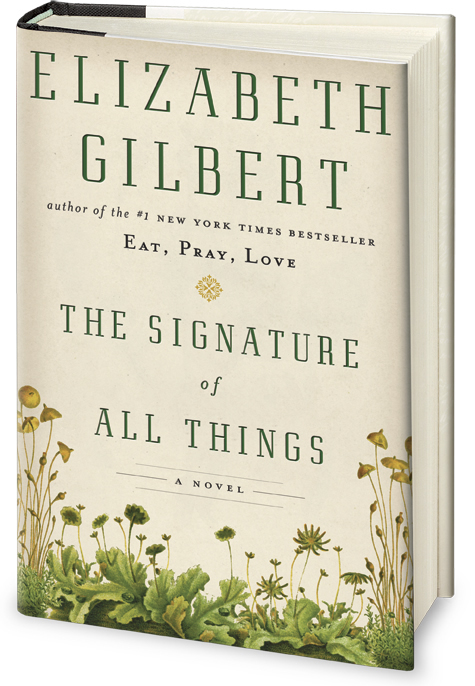 “Yes,” said Elizabeth Gilbert. “I care on you.” And, the funny thing is, in this world where our heroes are constantly disappointing us, she really does. Check her out on book tour now. Typically, I feel as though I have two kinds of dreams. One is some sort of processing activity – random images and feelings that are actually a decompression of my life experiences. The second are the dreams that seem to be something a little more. 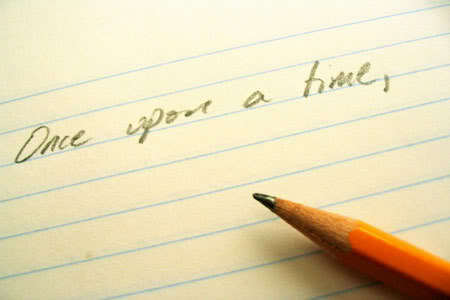 You know what I’m talking about: The dreams that seem like intricate stories or movies in your mind. The ones that come complete with sounds and colors and smells. The ones that actually seem to mean something. Recently, I’ve been having some income work/creative work balance issues. That is, I am challenged by the time I spending on my writing obligations to others and my writing obligations to myself. I have blogged before on this topic, settling on the 10% theory, as a way of guaranteeing my creative funtime. But the 10% wasn’t working. I ended up spending way more time on my creative writing than I did on my income writing, or vice versa, and I was feeling deeply anxious about keeping up with everything. I needed some sort of plan beyond the 10% to help me right myself on the page. This was on my mind as I fell asleep a few days ago. 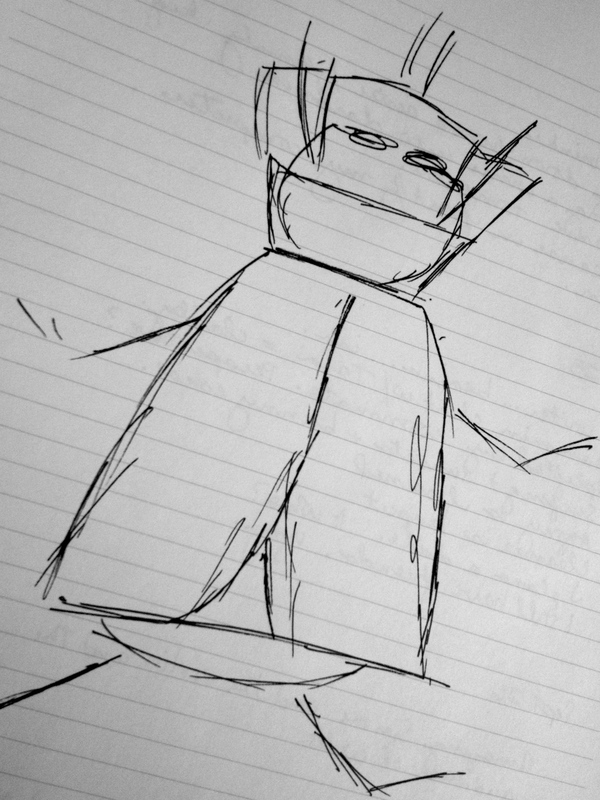 That night, I dreamt about a creepy insect. It would not leave me alone. It was everywhere: this giant beetle-like creature that I did not recognize and could not name. It infused my dream, like some sort of gruesome action sequence out of Indiana Jones and the Temple of Doom. Upon waking (and resisting the urge to vomit into my pillow), I pretty much assumed that this was some sort of stress dream. Still, I was so perplexed by the pervasiveness of this insect in my dream that I had to sketch it out (which is an odd impulse for me since I draw like a worm). As I drew, I found that I kept wanting to add some sort of long appendage to the insect’s nose. I kept picturing it in my head, this black beetle with a…trunk. How strange, I thought as I sketched. I wonder. Is there such thing as…an elephant beetle? Google taught me a lot about the insect world that morning (and freaked me the frak out). I did actually discover the existence of said Elephant Beetle, an insect I had never seen before and probably would not be a fan of actually encountering. (I can’t even look at this image for very long without cringing in my desk chair). The Elephant Beetle was a perplexing discovery, as the picture is remarkably close to my own kindergarten rendition of my dream beetle. My logical mind had been under the impression that dreams could only consist of images I had actually experienced in my waking life. This must be some magical message from the universe, I decided. Maybe it was a warning of danger to come. Maybe it was a sign to pay attention to where I am walking. I decided to delve further. I paged through the Google listings, discovering oodles of information on Elephant Beetle native habitat (not California, thankfully), flight activity (WTF, these things fly? ), and their potential to be weaponized (“future sci-fi thriller material,” I note in my journal). Then, Google eventually led me to a hit on YouTube which caught my eye. It was entitled “The 6 ‘P’s to Overcoming Procrastination.” I was intrigued. Why in the world did this come up on a search for information on Elephant Beetles? I started watching the video. It was good, full of interesting techniques to deal with procrastination. Okay, cool. Just when I was about to switch it off, at about the five minute mark, there it was. All of a sudden, I knew why I dreamt of this creepy critter. According to Kirsty O’Callaghan (who has the most amazing Australian accent, by the way), if you are having trouble balancing your necessities with your funtime, the first order of business in the morning is the thing you don’t want to do. There’s always that one thing that you have to do but you would much rather put off. Do it. Because after you do it, you will be free from the burden of it for the rest of the day, leaving your mind open to enjoy and explore. When I read this, something clicked in my head. Was this the answer to my balance frustrations? I thought about her advice. Yes, I could still spend my first 10% creatively – journaling, meditating, whatever I needed to do to wake up and feel grateful for the day. But the next step was not necessarily to delve into my creative funtime projects. 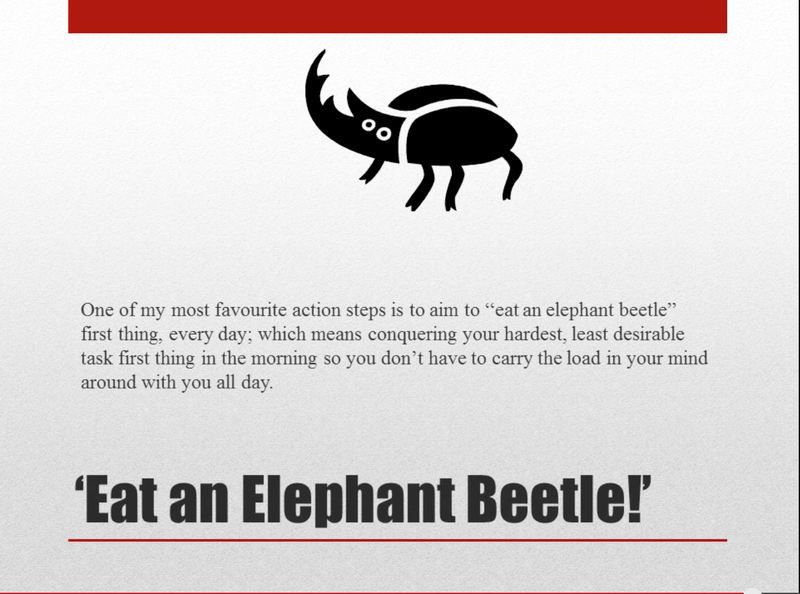 The next step is to eat an Elephant Beetle. It makes a lot of sense. Part of the reason we creative types resist the urge to indulge our projects is that we always feel the weight of something more pressing in our list of obligations. We try to compartmentalize, but sometimes it bleeds into our work without us being able to stop it, and all of a sudden we are making a “To Do List” in the margins of our morning pages. 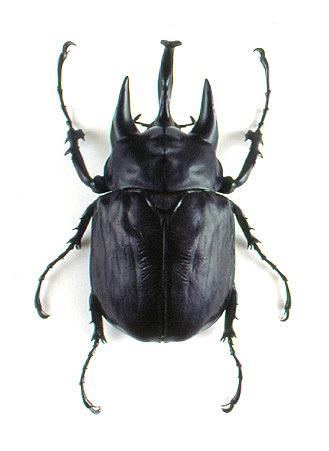 Perhaps if we spend the first task of the day eating our Elephant Beetles, they wouldn’t come creeping and crawling into our creative writing (or in my case, my dreams). Maybe I will keep this Elephant Beetle picture by my computer each day until I actually finish whatever it is that would qualify as “eating” one. Then, I will give myself permission to turn the picture over and get to the things that fill my soul. Because, honestly, this picture terrifies me. But it doesn’t scare me as much as not actually getting to write today. 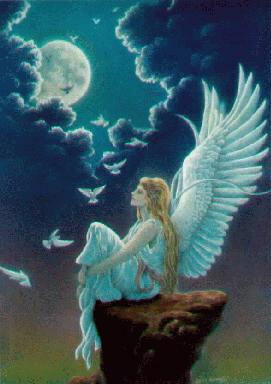 Do you have any suggestions for links to dream interpretation? Please comment below.